In the world of beauty, serums are very popular. There are still some people who don't know what a serum is or what it does. The most basic serums, help with wrinkles, pores and hydration. They can be used alone or with a beauty routine that you already have in place. They can be used day and/or night and most serums, dry very quickly. You can put make up on a few minutes after putting on a serum or go straight to bed and nothing will get greasy or unmanageable. 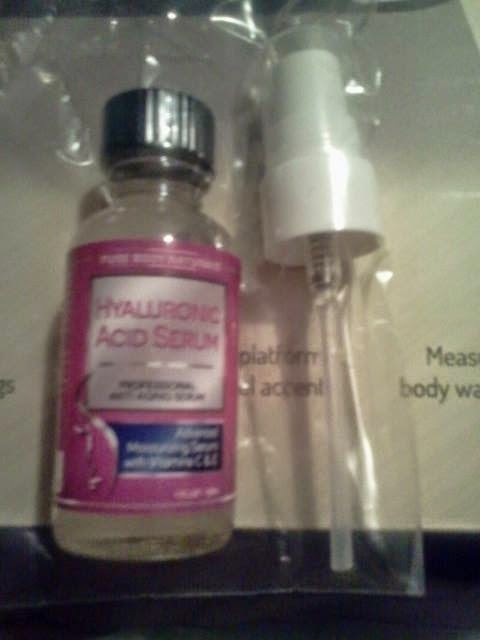 This hyaluronic acid serum by Pure Body Naturals says it is a Professional anti aging serum. It is a moisturizing serum which includes Vitamins C and E. This serum is made with natural ingredients and antioxidants that help repair sun damage. One of the best things about this serum is the fact that it is made and crafted in the USA. It comes in a pretty big bottle. I like the colors that the chose and I am not even a person who likes pink. But the colors really work together. the writing is big enough for most people to be able to read and really compliments the colors on the bottle. It puts a lot of emphasis on what it is and what it does right on the front of the bottle in big letters so there is no mistaking what it is for. A lot of companies have forgotten how important it is to really showcase what the product is and what it does so they are over looked by potential customers. I really love that this comes with the pump top. The pump top is so much better then the eye droppers that a lot of other serums are using. Helps with the application process. 2. Spray product into the palm of your hand. 3. Dip your finger tip into the product and apply dots all over your face. 4. Using your middle finger (it applies the least amount of pressure) gently rub the product into your skin, making sure to get your whole face and neck covered. While making sure you do not get it close to or in your eyes. 5. Let dry and then go about your routine, put on your make up, go about your day, or jump into bed. This product is easy to use and easy to figure out what to do. I like many things about this product including the pump top, the attentions to detail on the label and bottle, risk free guarantee which means they really stand by their product and believe in it and how easily it absorbs into my skin. This product didn't break me out like other serums and it left my skin feeling tight and glowing. The fact that the smell is mild and isn't bad is also a good thing. The natural ingredients really help to push this product over the top for me. I will for sure be using this in my daily routine from now on. This product is risk free, if you don't like the results or if it doesn't work for you then they will refund your money. Want to find out more about the product and what other people think about it? Then go check it out on Amazon by clicking here. Right now you can get it for under $15 and with it being risk free, all you have to lose are some pesky wrinkles!